to accomodate any organization's needs. 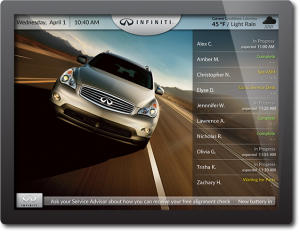 Typical display software can be complex and daunting to users. With generality and flexibility comes complexity, learning curves, and dependence on information technology resources. Industrial Television Services signage solutions are built for specific applications and custom-tailored for specific markets, clients and applications. ITS designs, delivers, and supports digital media solutions that are easy to use. Our products eliminate the need to learn complex software, transforming the way our clients do business. With over 50 years in the industry, ITS possesses strong core competencies in display technology, video distribution, video streaming, digital vision, real-time interfaces and software development. Customers rely on ITS to understand their specific business needs and processes. Our powerful offerings are custom built for specific markets – translating into immediate client benefits. At ITS, we value our diverse workforce of experienced people committed to working together, learning, improving their skills and achieving the highest level of customer satisfaction. At Industrial Television Services, we make it our mission to take the complexity out of digital signage software and hardware. We are a solutions provider, delivering satisfaction and ROI to our clients. ITS works with each client one on one to determine their goals and business needs. Our experienced creative, technical, and support teams then handle every step of your project from early design all the way through to installation. We don’t stop there – we are available every day, all year round to ensure your systems are running smoothly. No complex software, no coding necessary – just tailored products driving results. 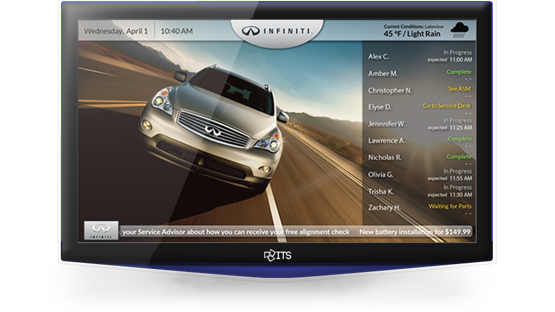 We work closely with our clients to provide tailor-made, turnkey display solutions. Industrial Television Services (ITS) announced that it implemented its TransitPort travel information system at Central New York Regional Transportation Authority (Centro) William F. Walsh Regional Transportation Center in Syracuse, NY. 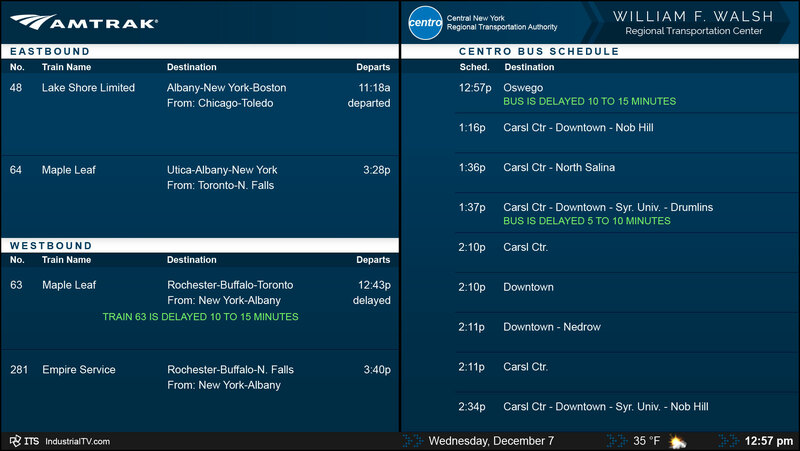 TransitPort screens show updated mass transit departure times and destinations. Video Wall Monitors – Our wall displays are the ideal solution for a variety of verticals and locations. They are a prominent and attractive way to highlight your company’s digital content. 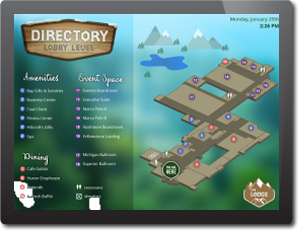 Virtual Concierge Displays – Our Virtual Concierge offering is the essential resource for your guests. Upon arrival, visitors interact with this application and plan their stay, accessing your products, services, and recommendations with ease. In-Store Retail Digital Signage – Dynamically showcase your latest inventory and inspire your customers to make a purchase. ITS retail products command attention from shoppers, drive sales and reinforce your store’s environment and personality. 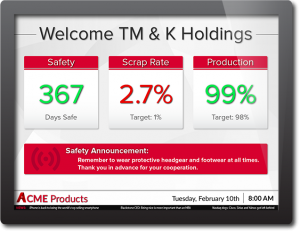 Signage for KPIs & Metrics – Whether you’re in a corporate environment or on the factory floor, our KPI displays are the perfect means to measure, monitor, and display employee and company progress. Not only are they both advanced and easy to use, these signs can actually boost internal productivity and efficiency.